We begin at the Howlett Estate up on “The Hill,” home to John Howlett, the son of a domineering self-made millionaire. John’s eldest son has died of a sudden fever years earlier, an event that sent the mother (and John’s wife), Elizabeth, briefly to an insane asylum. 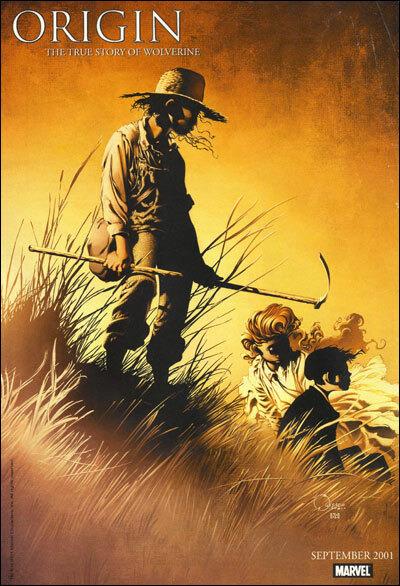 To help raise the youngest and now only son, James, a young girl named Rose is hired from the village. At the estate she encounters Thomas Logan, the groundskeeper and a drunkard, who lives nearby with his Huck Finn-like son, nicknamed Dog. Though James Howlett is frail and sickly, the three youths, James, Rose and Dog, spend the summer together, frolicking as kids do. One day, while James and Dog play near the water, James falls in and Dog rescues him. Later that evening while James recuperates, Thomas Logan beats his son for fraternizing with “their kind.” When Christmas arrives months later, James receives a puppy while Dog observes through a window. John Howlett takes pity on the poor child and gives him a toy train, but when Dog shows his gift to his father, Thomas Logan beats his son once again. Several years pass and James Howlett, now a young teenager, still appears pale and weak. Rose, while continuing to attend to her duties, accidentally sees Elizabeth Howlett being dressed and notices three horrible scars across her ribs as if she had been clawed by an animal. In shock, Rose runs outside and is physically accosted by Dog. James witnesses the attack and alerts his father and before long John Howlett berates Thomas Logan over the conduct of his son. The following day, Dog attacks James in a secluded area of the grounds for ratting him out and kills James’ dog, Callie. By evening, John Howlett has Thomas and his son thrown off the premises, but later that night, they sneak back onto the estate grounds with rifles, forcing Rose to help them break into the house. Once inside, Thomas finds Elizabeth Howlett and tells her that she is leaving with him. At that moment, John Howlett barges in, and Thomas decks him, threatening him with the rifle. All of the sounds wake James, who walks in just in time to see Thomas fatally shoot his father in the head. Something snaps deep inside James, and he attacks Dog and Thomas. As Thomas pushes him away, we discover that James has bone claws coming from the back of his hands, claws that he uses to impale Thomas Logan, killing him on the spot. After witnessing the bloody deaths of her husband and Thomas Logan, Elizabeth Howlett spurns her son James and his bone claws as an abomination. James flees the house in tears, while Dog tries to stop the bleeding from the severe facial lacerations he received in his scuffle with James. Outside, Rose tends to a now unconscious James Howlett, while inside, Elizabeth, clearly losing her grip on sanity, picks up Dog’s rifle and calmly kills herself. A theory by Aaron Stack (Machine Man) in a future time line posits that Logan came from the Moon Tribe, a race of humans who remained feral and wild in Northern Canada. 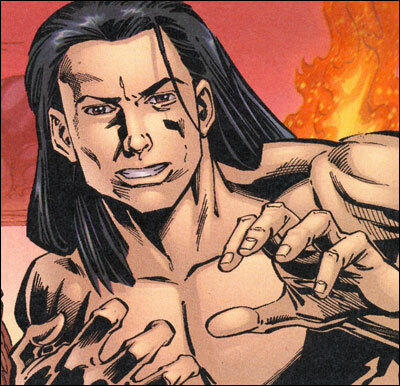 He further argues that Sabretooth is from a rival tribe, the Bear Clan. Additional speculation by Kyle Richmond (Nighthawk) suggests that the young, feral Logan was found and adopted by a well-to-do family, the Howletts, as a surrogate for John Howlett, their sole heir who passed away in 1897. Because this feral child showed no infirmities like those of a normal child, the family kept him secluded in the house, feigning illnesses to keep him out of sight. 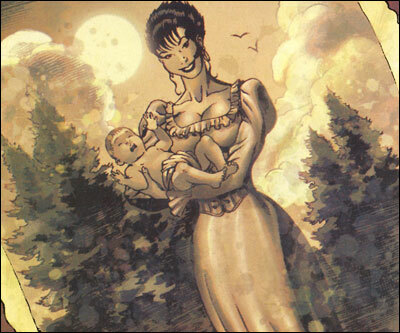 While searching for a man name Kitsunebi, Logan has a vague memory of a photograph showing his father and mother holding him as an infant. Later, when he finally does meet Kitsunebi, the White Ghost, Logan discovers the stranger is a mutant with ghost-like shifting abilities and bone claws extending from the backs of his hands, eventually revealed to be Logan’s older brother, John Howlett. With the revelation that he has a brother, Logan suddenly remembers being told as a child that John had died. His brother then gives Logan a photo taken by their father of James as an infant in his mother’s arms. John Howlett explains that their mother was having an affair with the gardener, Thomas Logan. When he confronted their mother about it shortly after James (Logan) was born, John was overcome with anger and sprouted bone claws from the back of his hands, gashing her mother’s ribs in the process. John’s father and grandfather arrived and subdued John. The grandfather took responsibility for John, promising “…the very best medicine has to offer,” but instead committed him to a lunatic asylum for the next fifty years. Logan is mentally regressed by Cassandra Nova to his childhood. Among the many things we learn about young James Howlett is that he likes to cut out paper chains and is deathly afraid of tigers, especially blue ones as large as a moose. After regaining all of his memories, Logan begins to dream of Lupines, a race of wolf-like men who hunt sabretooth tigers in prehistoric times. Logan’s dreams continue with the Lupines wiping out a group of Neanderthals. While in Wakanda, Logan’s dreams evolve into those of Lupine warriors fighting on an ancient battlefield with armored elephants reminiscent of Hannibal. Much to Wolverine’s astonishment, he finds the ancient bones of the Lupines in a Wakandan elephant graveyard. Still in Wakanda, Logan’s dreams progress into those of Lupine gladiators fighting in the Colosseum of ancient Rome. Based on findings from the archaeological site, Black Panther and Storm pose the theory that Logan and other feral mutants like Sabretooth evolved from Lupines and are not actually mutated humans. The theory posited by Jeph Loeb (through Black Panther and Storm) that Wolverine, Sabretooth and a handful of other feral mutants are actually evolved from wolves is pseudo-science at its worst even for the Marvel Universe. There is simply no credible evidence to support the theory that a heretofore unknown species is responsible for a handful of individuals already identified beyond a shadow of a doubt by Cerebro and the High Evolutionary (to name but a few) as mutants. After a climatic battle with Sabretooth, Wolverine is confronted by Wild Child who claims that there have always been two great Lupine warriors throughout the ages and that Wolverine represents the greatest Lupine warrior of all time. He further reveals that the mysterious Romulus is the leader of the Lupine race throughout all of time and gave these dreams to Logan so he could better understand his heritage. When Professor Xavier probes Wolverine’s mind to help him regain his memories, Logan has a flash of the first time he popped his claws as James Howlett. The young superhero team Power Pack uses Reed Richards’ time platform to go back to New York City around the turn of the century. They find a young James Howlett being accosted by local ruffians and use their powers to help him out. James explains that his father is in town to discuss real estate matters. “He brought me with him because he thought that getting out of the house would do me some good but my allergies have been worse than ever since we got to the city.” Later when James is kidnapped, Power Pack comes to his rescue with the aid of Herbie, the Fantastic Four robot, but James faints dead away when confronted with a talking, flying robot. James finally returns to his father and bids a fond farewell to his new friends. Back in Canada, James seems invigorated by his experience, jousting with Dog as Rose looks on. Nick Fury provides Logan with previously unknown information about his family history, including the fact that Logan’s mother was originally Elizabeth Hudson, sister of “…Elias Hudson, owner of the Hudson Bay Company.” Unfortunately, the company was named after the Hudson’s Bay, hence their name — Hudson’s Bay Company. We also learn that young James accidentally saw the scar marks on Elizabeth’s ribcage, presumably from his brother John. Wolverine dreams of when he was first popped his claws as James Howlett and killed his father’s murderer. After defeating the Devil in Hell, Logan comes face to face with his biological father, the groundskeeper Logan. Christopher Lawrence, “Secret Mission,” Wizard #120, September 2001. “Paul Jenkins Talks Origin,” Comics Continuum (www.comicscontinuum.com), May 24, 2001. Richard Ho, “Logan’s Done,” Wizard #146, December 2003. It should also be noted that in Wolverine: The End #5 the man known as John Howlett, Kitsunebi, the White Ghost, admits that while he knows Logan intimately he is no brother of his. Congratulations on having the best wolverine site on the web. Thanks for the kind note. I believe John Howlett’s comment was intended as a red herring by the writer because in the following issue, John Howlett repeatedly asserts that Logan/James is his brother. My interpretation is that the comment was intended to represent John disowning his brother, not denying their biological heritage. I thought Rose was the one with scars on her ribs..? I just re-read the issue… it is definitely Elizabeth Howlett with the scars on her ribs. thanks man. I’ve had a look. So origin/s are really as bad as they say huh? I think everyone has a different opinion on the Origins series. I personally think it’s a great series and I’ve stated my opinion here , here , here , and here is my rant for Logan’s code of honor. Okay. But would you say origin is a good way to start? Or is it recommended to read a few other stories first? And also, a stupid quesiton but anyway, is there an origin and an origins series? or a the two the same series? Personally, I cannot recommend ‘Wolverine: Origins’ as it shows Logan to have committed atrocities that are simply beyond the pale. And ‘Wolverine: The Origin” (a different series) is overly melodramatic and trite in its telling of Wolverine’s earliest days. I would recommend ‘Weapon X’ by Barry Windsor-Smith and the first ‘Wolverine’ limited series by Chris Claremont and Frank Miller. These two collections show Wolverine at his best… and are a good beginning before you make your way into stories and series that fail to capture what made Wolverine so popular. well people, I’ve made my decision and I’ll be starting with Weapon X to later on move on to the essential X-men stuff. Hopefully this’ll get me interested and give me enough info on all edges and areas. From that maybe first class. But I want to wait with origin a bit to keep the “mystery-thing” alive. Thanks for all the help so far. Probably haven’t heard the last of me yet. :P Cheers! Does anyone know if a direct sequel to Origin will ever be made? I would like to see what happened to Logan and Dog. I mean it was never really confirmed if Dog was or was not Creed and I would really like to see that Logan had full knowledge of his past at least at some point before Weapon-X. I really liked Origin too. I personally like it more then the overly praised Weapon X story line. Origin doesn’t have any direct tie in’s yet, with the exception of the “Wolverine: The End” story line. They haven’t said Dog is Sabretooth and I really hope they don’t. I am guessing Romulus might be Dog though, since it seems he want’s to make Logan pay for something. He even said that turning Logan into his weapon is a “act of revenge”. I just don’t get how Logan in ‘X-Men: Origins’ kills his real father but leaves who he thought was his father but there were scars on Logan’s/James’ mom’s ribs but it didn’t say it in this movie. I’m confused, please help me. Just looked at my above post……..one problem there is, Dog isn`t Elisabeth`s son……so he and white ghost share no parentage, his ma musta bin a mutie too. I always thought that John Howlett would be Sabretooth, and that Dog would be the middle child. As an adult, Dog still bore the facial scars; which would mean he doesn’t have a healing factor and couldn’t be Sabretooth. 013: Secret Agent Man, Eh? Copyright 2005-2010 by Joel 'DiG' DiGiacomo and Typing Monkeys. Proudly powered by WordPress and (modified) SimpsonsHB Theme by Angelina.